I ran across an article about government controlled internet use in China. While we who live in the U.S. worry that we are confronted with a dizzying array of news and fake news, in China the government is working to control what people are able to access on the internet and ensure that only one source of news about the outside world is available. 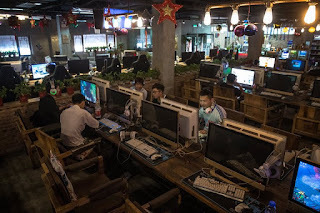 The New York Times article titled, China’s Internet Censors Play a Tougher Game of Cat and Mouse, describes the ability of the government to control what the populace is able to access. SHANGHAI — The shutdown was unusual, and came without warning. Chinese censors tested on Thursday a new way of shutting down websites and cutting off the country’s internet users from the rest of the world. The censorship drill targeted tools that many in China use to thwart the country’s vast online censorship system, though internet companies said it also hit some sites at random. Americans, need to treasure our unfettered internet access. We also need to understand that evaluating the source and authenticity of the news and information we are receiving is one of the requirements that comes with our freedom. Let's realize that the freedoms we enjoy are precious and not shared by people living in other countries and that they come with responsibilities.